Distribution Once occurred widely in southern Africa but now restricted to the northern parts except for a natural population in the Drakensberg and numerous localities where it has been reintroduced to farms and reserves. Habitat The Eland occupies a wide range of habitats from desert scrub to montane areas but shows a preference for open scrub-covered plains and woodland savanna. Food Predominantly browsers, Eland do occasionally eat grass. They dig for roots and bulbs with their hoofs and also use their horns to knock down foliage. They are independent of water but will drink when it is available. Hunting Tips Older males typically loose hair, giving a greyish colouration as the dark skin shows through. 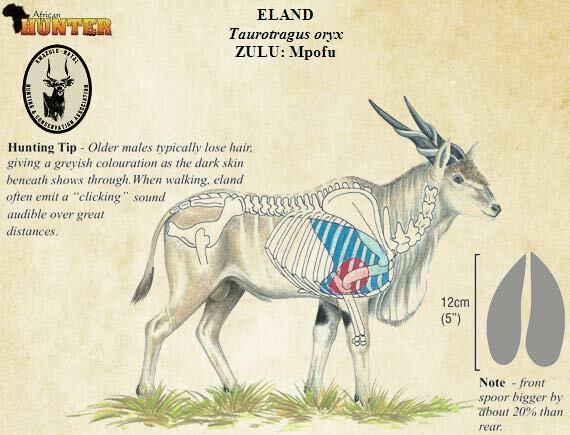 When walking, Eland often emit a “clicking” sound audible over great distances. Thick skin in the neck area. Silent antelope with acute sense of smell and hearing.